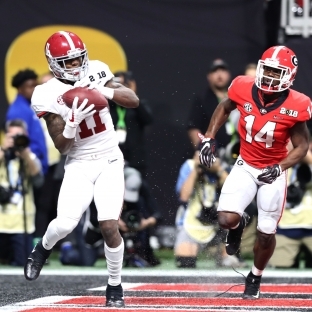 Alabama decided to make a quarterback change at halftime of the College Football Playoff national championship game and the early returns paid off. Backup quarterback Tua Tagovailoa, a true freshman, replaced Jalen Hurts and he led Alabama on a scoring drive on the Crimson Tide’s second possession of the second half. Before the touchdown throw, Tugovailoa kept the drive alive with a huge scramble for a 1st down on 3rd-and-7. Tugovailoa found a wide open Henry Ruggs III in the back of the end zone to cut into Georgia’s lead. Watch the touchdown pass below.